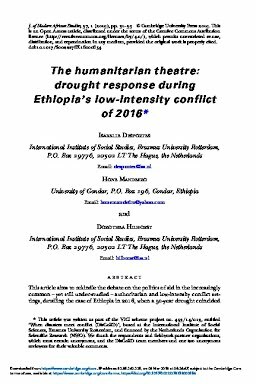 This article aims to rekindle the debate on the politics of aid in the increasingly common – yet still under-studied – authoritarian and low-intensity conflict settings, detailing the case of Ethiopia in 2016, when a 50-year drought coincided with a wave of protests and a state of emergency. During four months of qualitative fieldwork in 2017, state, civil society, Ethiopian and international actors were approached – from humanitarian headquarters to communities in the Amhara, Oromiya and Somali regions. Research participants relayed stark discrepancies between the humanitarian theatre's ‘frontstage’, where disaster responders showcase an exemplary response, and its ‘backstage’, where they remove their frontstage masks and reflect on the information, the decision-making monopoly of the state and the intrusion of conflict dynamics into the humanitarian response. In humanitarian research and in policy, a collective conversation is necessary on where to draw the line between respect for governments’ sovereignty and the intrusion of humanitarian principles.